For more information about a specific lodge, choose from the list below. DISCLAIMER: information regarding Lodges in Toronto East District as presented on this website is believed to have been accurate as of the time of publishing, however we make no guarantee as to the accuracy, completeness or timeliness of any data. For specific information regarding a Lodge please contact the Lodge directly. LODGE SECRETARIES:To update or or make corrections to information about your Lodge on this website, please contact the Webmaster of the Toronto East District website. 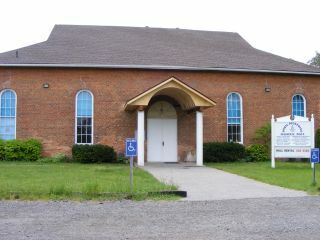 The building was erected in 1867 by the Society of Friends Congregation at a cost of $6000. A fire caused by lightening on June 24th, 1908 destroyed all but the outer walls which are 20 inches thick. The building was rebuilt within these walls the same year for the Quakers by an Oshawa contractor. By the 1920’s services at the Meeting House had been discontinued. The building was used by several groups before falling into disuse in the 1930s. Negotiations for purchase by Doric Lodge were begun in late 1942. The purchase was completed in May 1943 and the work of renovating in order to make it suitable for Masonry was carried out. Much of this work was contributed by the members. The chestnut benches contributed to the original Society of Friends building by the Quakers of Philadelphia were retained and are still in use. The Lodge Room was dedicated May 18th 1944 by M.W. Bro. T.C. Wardley and his accompanying Officers. Over the years the members of Doric Lodge made many changes to improve the amenities within the building while maintaining the integrity of the structure. In 1991 “The Doric Pickering Masonic Hall Corporation” was formed as the legal entity to maintain and manage the property for the members. The Board of Directors elected by the Brethren of Doric Lodge continued with this philosophy in preserving and upgrading their beloved building until 2016. The building is currently being renovated to add a basement, accessible washrooms, a kitchen and lodge room upgrades. Meetings are temporarily being held at the Mill Street Community Centre, 25 Mill Street, Ajax. There is an Ontario Historical Plaque on the property near the Mill Street entrance and another across the street noting the Society of Friends Graveyard located there.